How do you like your tea? If you’re English, you may enjoy it with milk and sugar. If you’re French, a slice of lemon is the custom. For the Chinese, tea ceremony is a cultural mainstay. No matter how you take it or how much you enjoy, tea has become quite the health beverage. There are certain teas, though, that pack more health benefits than your regular orange pekoe or other black tea. These are known as herbal teas. Herbal tea health benefits can aid in ailments like indigestion, circulation, and calming the nervous system promoting relaxation. Herbal teas come from the combination of different herbs to not only create a great taste, but to promote health as well. These teas can also be considered medicinal teas because of their ability to assist in ailments. Some herbal teas and medicinal teas contain only a single ingredient. These single ingredient teas can be leaves, flowers, roots, berries or bark. Other herbal tea formulas contain tea blends. These can include a combination of the single ingredient teas. For example, you can mix herbs, berries and flower together to produce a wonderful tea blend. Some of the main herbal teas which can help improve our health are: Echinacea, hibiscus and rooibos. Echinacea herbal tea: Historically, Native Americans have been using echinacea for just about every ailment you can think of. Historic reports suggest they used the tea for malaria, blood poisoning and scarlet fever. Although these accounts have not been proven today, echinacea can still offer some health benefits as an herbal tea. The University of Maryland Medical Center reports that echinacea can aid in boosting the immune system, so if you’re feeling the onset of a cold brewing a Echinacea medicinal tea may help. Hibiscus herbal tea: Hibiscus can provide herbal tea health benefits as well. Derived from the hibiscus flower, hibiscus herbal tea has been noted to help blood pressure levels. You can reap the benefits of hibiscus medicinal tea with just two to three cups a day. Hibiscus medicinal tea is also packed with antioxidants which work in the body to prevent free radical damage. Antioxidants can help reduce the risk of illness and keep the body in tip-top shape. Rooibos herbal tea: Rooibos is a type of red tea from South Africa. Like many of the other medicinal teas, rooibos also contains high levels of antioxidants which can help prevent cell damage. Rooibos also contains such vital minerals as magnesium and calcium which are important to good health. When it comes to herbal tea health benefits, rooibos medicinal tea may also help in digestion similar to ginger. It can calm the digestive system reducing any stomach troubles you may be experiencing. Lastly, rooibos medicinal tea can help boost circulation, so similar to hibiscus herbal tea, in can help with blood pressure as well. There isn’t much difference in preparing a regular tea and a medicinal tea. Depending on which herbal tea you wish to make, the steeping time may vary. Generally speaking, all you need to do is add hot water (208 degrees Fahrenheit) to your herbal tea ingredients and allow it to steep. This refers to the extraction of flavors and the softening of the ingredients through the process of soaking. The longer ingredients soak for, the stronger the tea will be. Flower ingredients: If your medicinal tea contains flowers, five to six minutes is enough steeping time for optimal herbal tea health benefits. If flowers are steeped too long they may begin to taste bitter. Leaves: Leaves take a bit longer when preparing medicinal teas. Leaves should steep between six to eight minutes. Because leaves can hold onto their flavor longer, you don’t have to worry about over-steeping. Roots: Because roots come from the earth they can take slightly longer to get the optimal flavor. Ideally, steep roots like ginger for seven to nine minutes. If you want to speed up the steeping process, shred, slice, or cut down the root ingredient so more of the inside is exposed and the water can soak the core. 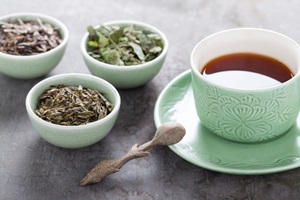 These suggestions for preparing medicinal teas are based on a single serving. If you plan on making a larger portion, increase the time accordingly with the amount of ingredients the herbal teas contain. If you wish to sweeten your herbal teas but don’t want to remove any of the health benefits, opt for natural sweetener like organic honey or agave. Adding milk to herbal teas – or any tea really – lowers the teas’ antioxidants and you minimize the intended health benefits. Whether you refer to them as herbal teas or medicinal teas, these teas offer worthy health benefits. Even if they aren’t targeting specific ailments, herbal teas are a great way to stay healthy, thanks to their antioxidant power. So if you’re looking for a natural way to feel better and live healthy, try steeping some of these herbal teas. You’ve boiled the water, picked out your favorite tea, allowed it to steep and then finished off the mug. Your next step is to probably throw out the tea bag, right? Well think twice before tossing out that little bag of wonder. We all enjoy our frothed mochas and cappuccinos as cold season hits, but research shows white tea could be your best bet to warm you up and keep healthy.